The perfect truck for pick-up and delivery of large packages or boxes. Sides are constructed of rugged 1" dia., 14 ga. round steel tubing on approx. 8" spacing and extends 48" above the steel deck. 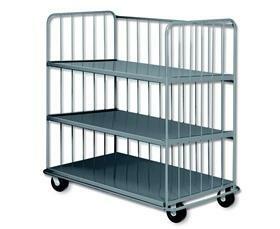 Rolls on 2 swivel and 2 rigid casters with choice of rubber tired or non-marking polyurethane tread 6" x 2" wheels. FOB Shipping Point. Ruggedly build, designed for hefty 1200 ib. load capacity. 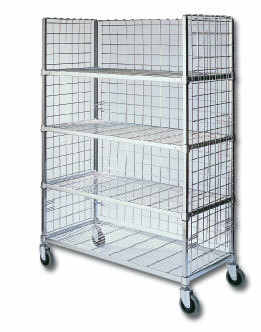 Wire mesh design for easy visibility, air circulation and safety. 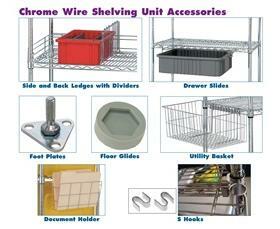 Shelf attached 3 x 3 mesh panels hook over the top shelf and into the bottom shelf for easy assembly. Additional slip ties keep panels in place during transit. Easy, smooth rolling on 5" x 1-1/4" Polyurethane swivel casters. Additional shelves available. FOB Shipping Point. 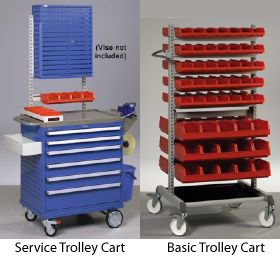 Open design cart allows 4-way access. Units easily adjust on 1" increments. 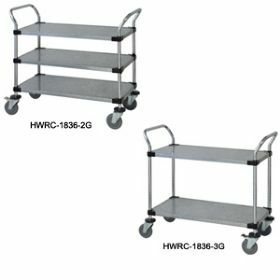 2 and 3 shelf carts come standard with 4-5" rubber swivel casters --­ 800 lb. capacity. 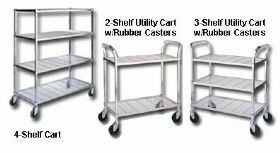 4 shelf carts come standard with 4-5" polyurethane swivel casters --­ 1200 lb. capacity. FOB Shipping Point. 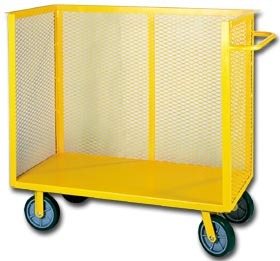 Keeps valuable materials secured while storing and transporting in environments where corrosion and rust resistance are important. 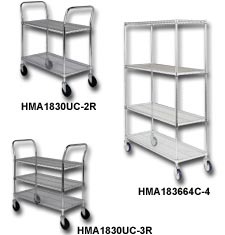 Smooth rolling cart for stock picking, package delivery or inventory work. Molded of high-density structural foam polyethylene shelf over 1" square steel tubular frame coated with a hard baked plastic resin. Square 16 ga. steel post is coated with a hard baked plastic resin. 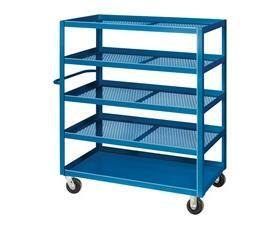 Shelves have Lifetime Guarantee against rust. 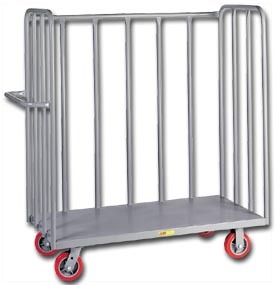 4-5" polyurethane swivel casters are standard. FOB Shipping Point. 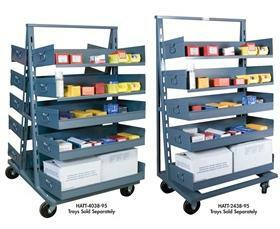 Functional Solid Shelf Mobile Cart unit consists of 4 solid shelves, 4 posts, 4 donut bumpers and 4 stem casters. Easy assembly.&nbsp;FOB Shipping Point. Built for heavy 2000 lb. loads. Frame is made from 1" steel tubing. 1/2" rods on sides and back. 14" clearance between shelves. 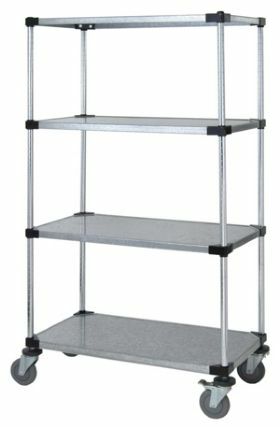 Steel shelves slope 1" from front to rear preventing contents from falling off during transport Shelves are made of 14 ga. steel. Smooth rolling&nbsp;6" x 2" phenolic bolt-on&nbsp;casters, 2 swivel, 2 rigid. 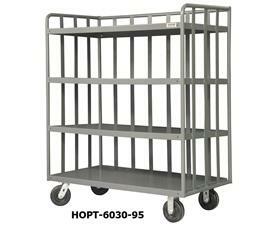 All units are 58"H. Gray powder coat finish. FOB Shipping Point. 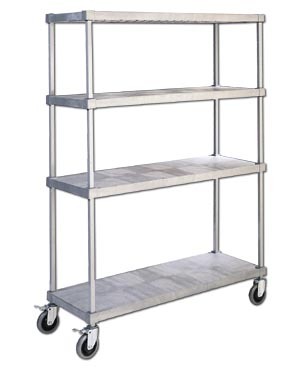 <STRONG>Side and Back Ledges</STRONG> - Ledges act as a perimeter to retain shelf items and prevent anything from falling off.&nbsp;Chrome finish. 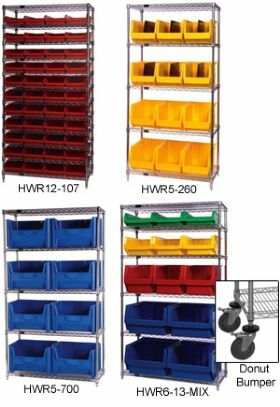 <P><STRONG>Dividers</STRONG> - Dividers are 7"H. and are available in 7 depths to be used with all shelves.&nbsp;Dividers come in 2 per package.&nbsp;Chrome finish. 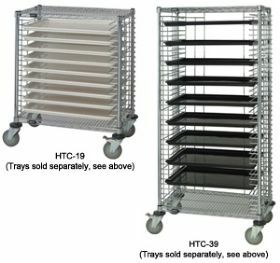 <P><STRONG>Drawer Slides</STRONG> - Single and double Drawer Slides compliment any system with specialized areas for storage and allow bins and trays to be suspended between shelves. </P> <P><STRONG>Foot Plates</STRONG> - Use of Foot Plate on post allows unit to be bolted to the floor for added support. </P> <P><STRONG>Floor Glides</STRONG> - Use of Non-Marking Floor Glides protect floor from damage. </P> <P><STRONG>Document Holder</STRONG> - Measures 12-3/8"L. x 2"D. x 8-5/8"H. </P> <P><STRONG>Utility Basket</STRONG> - Measures 17-3/8"L. x 7-1/2"D. x 10"H. </P> <br> FOB Shipping Point. <br> <br> See <strong>Related Items</strong> tab for other available options.